Buckeye Star Alpacas: Happy New Year From The Farm! Happy New Year From The Farm! Tonight Rich and I went outside before our dinner to feed the "girls" leaving behind a Kong-full of peanut butter to distract Callie who gets a bit jealous when we spend time in the barn without her. I took the camera out to snap a few pictures of the girls in the snow. They are not venturing out too far into the pasture the last couple of days. Our theory is that the snow is more compact and icy and not like the soft, fluffy first snow of Christmas. We think that when the snow is crunchy it is not so comfortable to their padded feet and it has a tendency to cling to their fleecy "leggings," thus they stay in the barn doorway or the small door yard just outside. Rich tried to herd them out into the snow and then back towards the camera. They just comically circled back around him and stayed as close to the barn as they could without going inside for their feed either. Consequently I never got the "running in the snow" picture that I was aiming for. 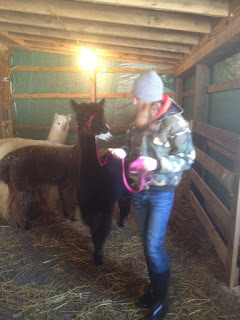 Rich corralled them into the barn and we gave Firenze her daily pro-biotic dose and fed them and hung around for a while just talking to them. The girls prefer to stay in the dooryard. 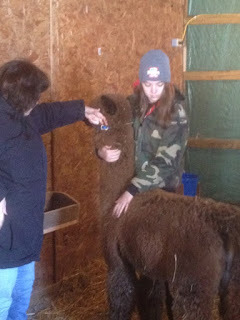 Baby Mango was tempted by the sweet feed. 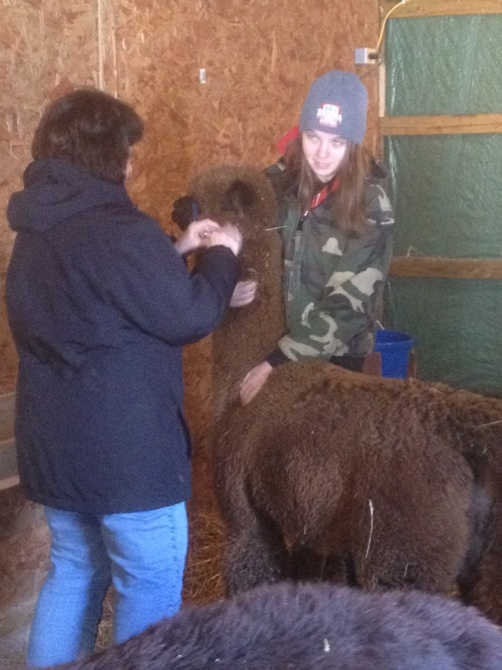 On Sunday, Pressley, my student who is a 4-H member and plans to make our alpacas her fair project for next summer, came by with her mom to spend another hour with the girls. That was the first day of Firenze's pro-biotic regimen so Pressley got to help corral her and administer the dose. 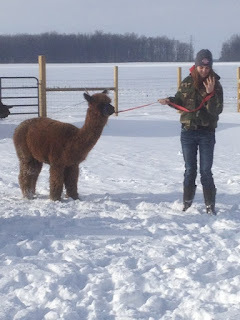 She also got to help halter Firenze and Leeza and walk them around a bit. 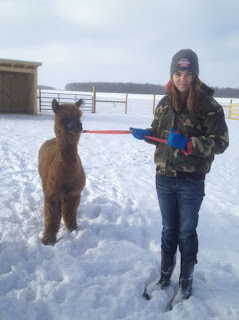 Pressley grabbed and held Leeza practically all by herself while I put the halter on her (the alpaca-not Pressley)! Then she took over. Leeza was a bit resistant to being walked in the snow but Pressley was patient and stood her ground and eventually Leeza followed. 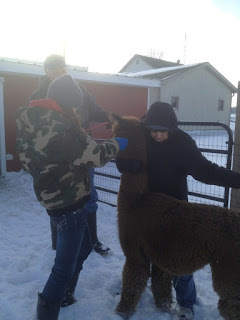 All-in-all it was a good training session both for the alpacas and Pressley. Time to remove the halter. Out here at Buckeye Star Alpaca Farm, Rich and I and all of our four-legged "girls" are optimistic for 2013. We are at the start of a whole new adventure and are having new experiences every day and look forward to learning more and more about these fascinating creatures. So far every day has been a joyous new experience. (even the frustrating ones) We wish for everyone a healthy, happy and joyous new year!